We told you recently about RIM co-CEO Mike Lazaridis' issues with interviewers. First, while being interviewed by the New York Times, he lashed out, asking why people didn't appreciate all the progress they've made over the years. Then, with the BBC, he stormed out of an interview when the correspondent asked him about their security issues in India and the Middle East. While the BlackBerry PlayBook has been eagerly awaited by consumers and RIM shareholders, early reviews are mixed. And the clever little comic below captures RIM's recent mood fairly well. While we suspect it might be tacky to jab a CEO this directly, we think the comic captures a pretty serious problem with RIM right now. 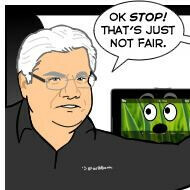 Mike Lazaridis is surely worried about losing ground to Android and iOS, but he can't afford to let his frustration show. What would happen if a nation's leader visibly panicked every time there was a problem with the economy? The economy would get even worse. In the same way, Lazaridis needs to exude some optimism before his attitude frightens away the shareholders. "While we suspect it might be tacky to jab a CEO this directly ...." Do not worry, Phone Arena. This Guy is BEGGING to be made fun of. Enough comic strips, and he might be an ex-CEO with a nice severance package, and a forward thinking replacement that might kick RIM into high gear and into some kind of competitive balance. Mike is begging to be fired. I have a playbook. Lasaridis aside, this is dead on. The playbook ROCKS. When bridged with a blackberry. Without it, it does feel a bit handicapped. When the native PIM and email is added in a few weeks, it will be an amazing device. After using it for a few days and then going back to my iPad, the iPad actually felt clunky, if you can believe it. The interface on the p,daybook is actually more intuitive. I know, sounds crazy, but it's true. And no, I don't work for RIM!